Pittsburgh, Pa. (March 21, 2017) — United Way of Southwestern Pennsylvania is pleased to accept a national award from the Association of University Centers on Disabilities (AUCD) at its annual AUCD for All Gala for work through its 21 and Able initiative. 21 and Able enables people with disabilities to find employment, so they do not graduate from high school to the couch. United Way’s work with the #IWantToWork campaign and Career Transition Project will be recognized. 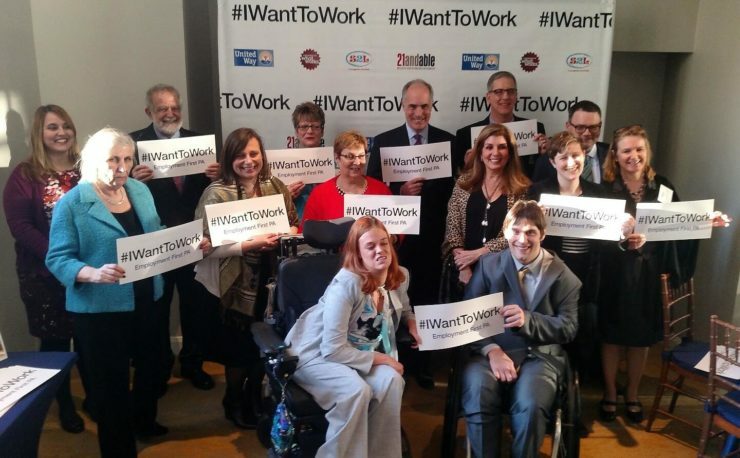 Powered by professional young people with disabilities, the #IWantToWork self-advocacy and social media campaign focuses on creating and advocating for policies that support the employment of people with disabilities at competitive wages in integrated settings. #IWantToWork developed the ideas and worked for the passage of House Bill 400, now Act 26, a law that requires the Office of Vocational Rehabilitation (OVR) to help high school students with disabilities access and keep summer, night, and weekend jobs, like all high school students. HB 400 received unanimous bipartisan support in the legislature and was signed into law by Pennsylvania Governor Wolf on May 17, 2016. To date, the campaign has driven over one million impressions from more than five hundred thousand individuals on social media. Thanks to the passage of HB 400 and efforts of #IWantToWork, new state and federal funds totaling over $23.5 million annually are now available to OVR to support employment efforts. Launched as a pilot program in September 2013 by United Way and Allegheny County Executive Rich Fitzgerald’s office, Giant Eagle, Inc. and Blind & Vision Rehabilitation Services of Pittsburgh, the Career Transition Project is an innovative employment and training initiative that works with young people with disabilities to secure work experience and paying jobs. Participating employers partner with local agencies to embed a Career Transition Professional in their offices, whose job it is to assist young adults with disabilities in obtaining employment and ensure their needs are met. To date, through the work of 21 and Able’s Career Transition Project, more than 265 people with disabilities have gained employment. Since its inception, Giant Eagle, The University of Pittsburgh, Allegheny County, FedEx Ground and Kurt J. Lesker Company have partnered with United Way on the project and committed to hiring more people with disabilities. Partnering agencies include the Office of Vocational Rehabilitation, Blind and Vision Services of Pittsburgh, Jewish Family & Children’s Service, and ACHIEVA. The second annual AUCD Gala will take place on March 22 from 6-10 p.m. at the Carnegie Library of Washington D.C. This year’s theme, AUCD for All – celebrating leadership in employment, will focus on fostering partnerships and collaborations within the community in support of meaningful employment for people with disabilities. Senator Robert Casey will present United Way’s 21 & Able with the award. Approximately 250 people are slated to attend. About United Way of Southwestern PA – United Way of Southwestern Pennsylvania, serving Allegheny, Westmoreland, Fayette and Southern Armstrong counties, leads and mobilizes the caring power of individuals, the business community and organizations to help local people in need measurably improve their lives. United Way creates long-lasting change for the betterment of our community. About 21 and Able—21 and Able, an initiative of United Way of Southwestern PA, is working to create a roadmap for youth with disabilities who are transitioning out of the education and supportive services system to continue their education, work, live independently, and participate actively in their communities. 21 and Able is working toward this goal via three strategies: the development of a public policy agenda and coordination of advocacy efforts; the creation of a public awareness campaign to draw attention to the urgency of issues related to youth transitioning to adulthood; and the design and launch of pilot projects that address the transition needs of youth with disabilities and their families. About #IWantToWork—The #IWantToWork self-advocacy, social media campaign is powered by young people with disabilities. The campaign focuses on creating and advocating policies to help people with disabilities prepare and obtain jobs in integrated work environments. It is a major element of the Campaign for What Works, a statewide civic effort initiated by The Pittsburgh Foundation, United Way of Southwestern Pennsylvania, the Greater Pittsburgh Nonprofit Partnership and The Forbes Funds to ensure the future of our vital human service programs and, above all, the well being of the people they serve. More information is available at www.IWantToWorkPA.org.